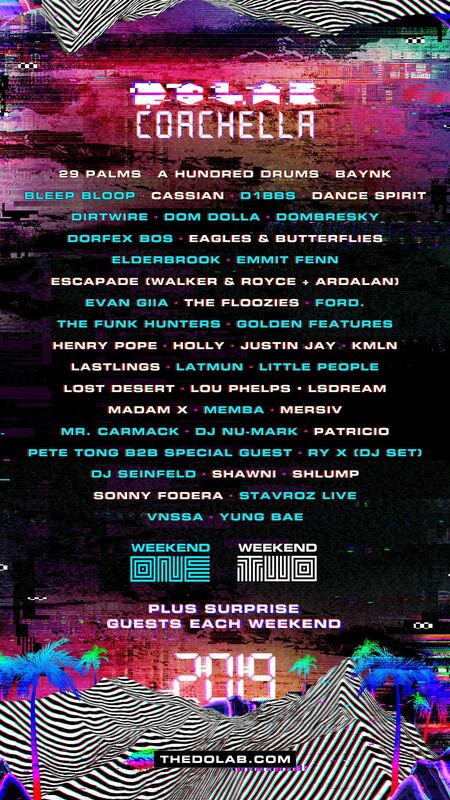 Do LaB, world-renowned leaders in redefining modern music and art experiences, have announced the 2019 lineup for their highly sought after stage at this year's Coachella Valley Music and Arts Festival on April 12-14 & 19-21. This announcement also comes with the debut of a brand new stage design apart from the notorious pineapple shape fans may be familiar with. As always, fans should also be prepared for the unexpected surprise guests to join the stage at night. Past surprise acts can be anyone from the actual Coachella bill or even surprise visitors like Skrillex, Richie Hawtin, Major Lazer, Bob Moses, Bonobo, RÜFÜS DU SOL, The Glitch Mob and more.